Does your PC performance are running slower and slower? Then you may need Wise PC Engineer to improve your PC performance. Wise PC Engineer is an all-in-one system tuning utilities which has been designed to improve the PC performance by clean up the Windows Registry, free up disk space, defragment registry and disk, erase privacy data and recover lost file. In addition to that, the application is also able to hidden important file or folder and lock personal application. 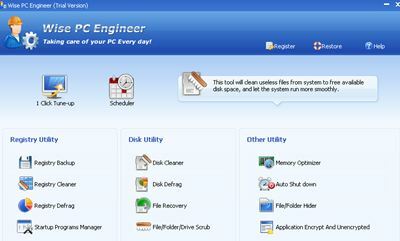 Full registry backup and registry restore, creating system restore point, creating undo data for each clean-up operation. Fast scan and clean with the use of advanced scan algorithm to quickly identify missing and invalid references in Windows registry and junk files. Able to choose to selectively clean each item or automatically fix all. Supports system optimization including erasing Internet tracing, cleaning Windows registry, cleaning disk and tweak system performance. Easy to use with few simple steps to clean, repair, optimize the Windows registry and free up disk space as well as supports 1-Click tune up for novice. Note: This special giveaway edition does not required serial key code to activate it.